Juniper is the only botanical which is in all gins. The cones of the juniper bush (often referred to as “juniper berries”) are required by legal statute, to be present and perceptible, in order for a spirit to be called gin. Juniper is in 100% of spirits that are designated as gins. 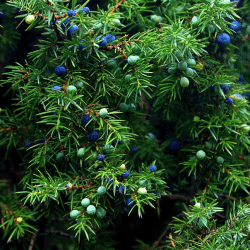 The juniper berry is known for imparting the traditional pine note of gin, although it can also come across as resiny, waxy, herbaceous, or even green and fresh. The juniper in gin is generally Juniperus communis; however, occasionally distillers use local species which can have a very different flavor in gin.